My rifles: I mainly hunt with my Remington 7400 Carbine .30-06 and my Marlin Model 1895 .45-70. 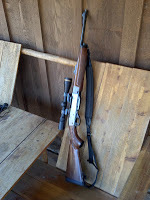 I prefer larger caliber rifles when hunting due to my preference of trauma and knock down (if you hit them hard enough with a big enough bullet, the deer will go down). I don’t hunt in any location that one of these two rifles can’t get the job done. I have a few others that I pull out occasionally to play with. Last year I hunted with an Enfield Mk III SMLE .303 rifle manufactured in 1915. My Backup: Hunting on crutches in an area that has fresh bear sign has made me a little cautious. I don’t venture too far out into the woods on the crutches but it takes me a good 10 minutes to get back and forth from my 4 Wheeler and stand. 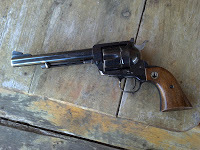 A few years ago I started packing my Ruger Blackhawk .44 Magnum. This is an older model Blackhawk manufactured in 1968. I can’t help it. 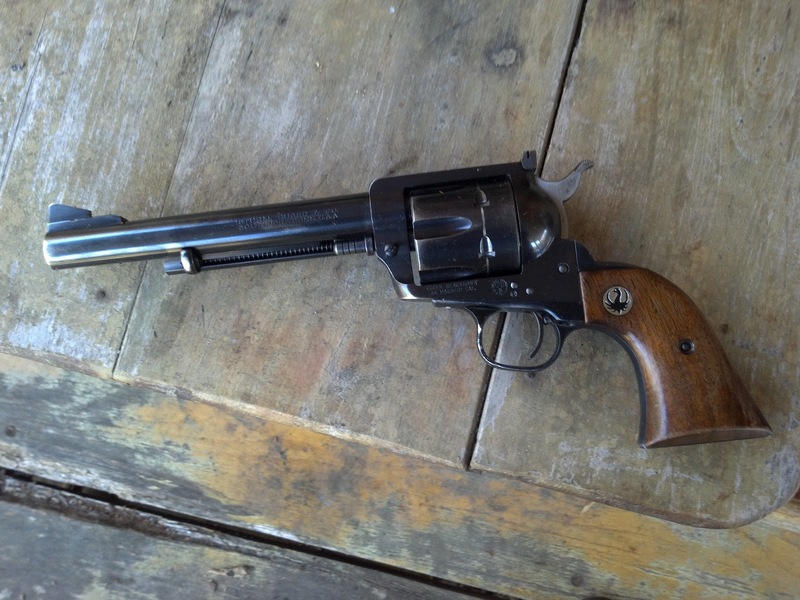 I have an affinity for older guns. I also have the goal of taking a deer with my Blackhawk if the opportunity presents itself. In the mean time, the black bear we nicknamed Tux because of the white patch on his chest is still roaming around and this fat boy on crutches can’t move very fast. Be sure to check out a pic of Tux I posted at the bottom. My pack: If you are going into the woods, you most likely will be taking a back pack with you. I like back packs, but I prefer a shoulder pack because of the ease I can access my gear when I have it on. 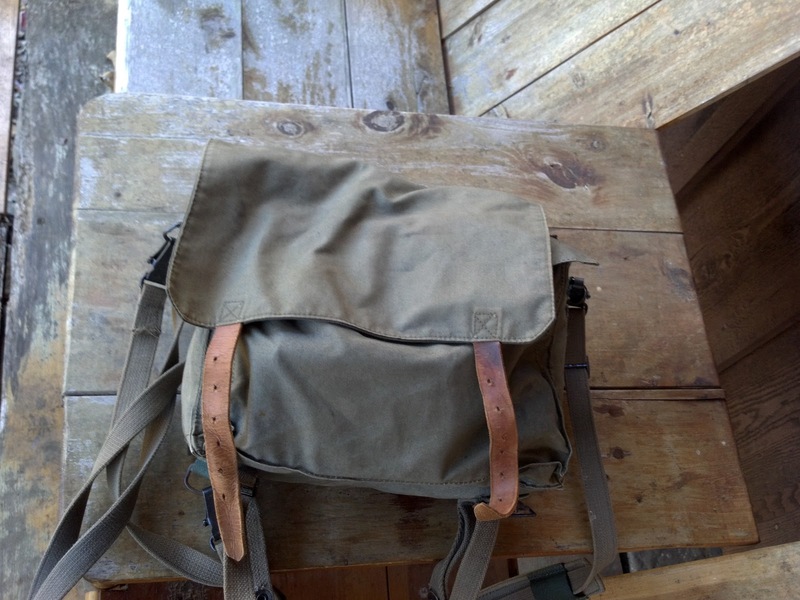 This year I bought a surplus Yugoslavian Combat Pack from Liberty Tree Collectors that can be used as a back pack or shoulder pack if you rearrange the straps. 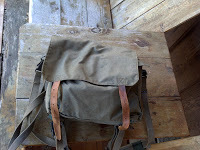 It has 2 inside pockets and plenty of room to carry everything I need. My Belt: I use an old Army web belt to carry my canteen, my Recon Tanto knife, my Ruger Blackhawk .44, a small pouch and sometimes my small binoculars. I like my old belt and have had it since I was 5. At the rate I am going, it will probably only fit for a few more years so I am going to keep using it until it doesn’t fit any more. 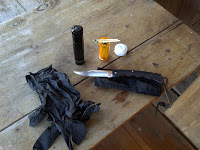 My knives: I use a BuckLite III folding knife that I keep in my pack for my field dressing and skinning. It takes a while to get a good razor sharp edge on a Buck but once you do, it will stay sharp through field dressing, skinning and boning out for at least two deer and is easy to get the razor edge back. I also carry a Cold Steel Recon Tanto fixed blade on my belt. I like this knife because it has a very heavy blade that is good for chopping. It also makes for a pretty good skinning knife. Again it took a while for me to get a good edge on it, but once I got it sharp, it has stayed sharp. 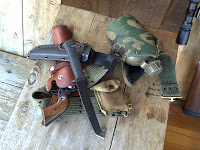 It also doubles for my camp/survival knife of choice. My Water: I use a plastic canteen in an insulated canteen pouch on my belt. Whatever you do, carry some water with you. You never know what might happen that might keep you out longer than you planned. I have been on too many Search and Rescue calls where when our team got to the lost folks, the first thing they asked for was water. 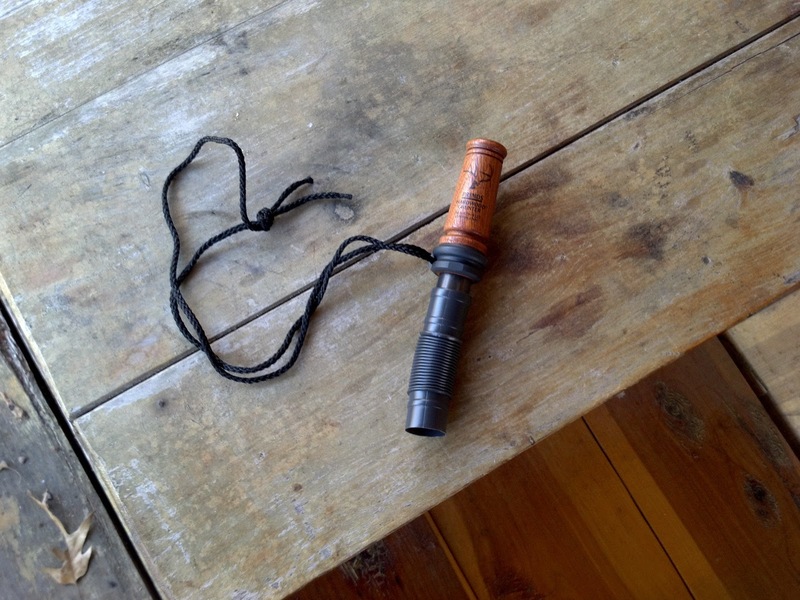 My Flashlight: On my recent hunt in Texas, I shot a nice 8 point Whitetail Deer and dropped him where he stood. There was another deer with a limp and deformed rack that hung around after I shot so I sat still and watched him until dark. 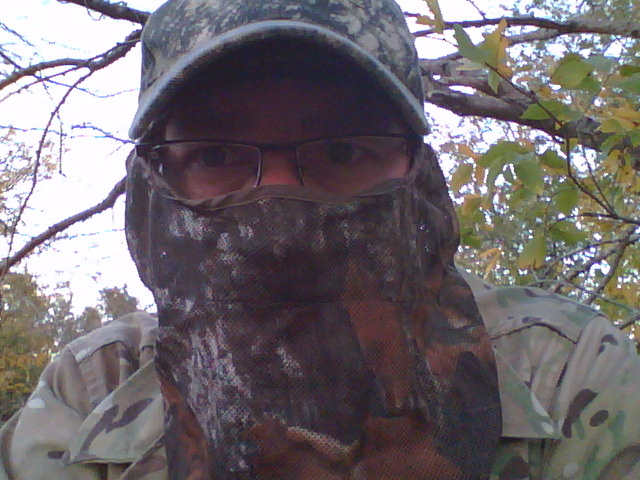 When I finally got up to look for my deer, I found that I flash light wasn’t in my pack (I still don’t know where it is). On my first trip to the store after I got back from TexasI picked me up a new flash light for my pack. I don’t recall the exact model but it is a MiniMag LED light that runs off 3 AAA batteries and will throw a 170 lumen beam out about 75-100 yards. By the way, I did find the deer finally with some help and a borrowed flashlight. My Matches: Just in case you get stuck in the woods unexpectedly, it is also a good idea to carry matches (or lighter) and tinder of some sort like a bird’s nest, laundry lint, and cotton balls covered in petroleum jelly or anything else to help get the fire started. 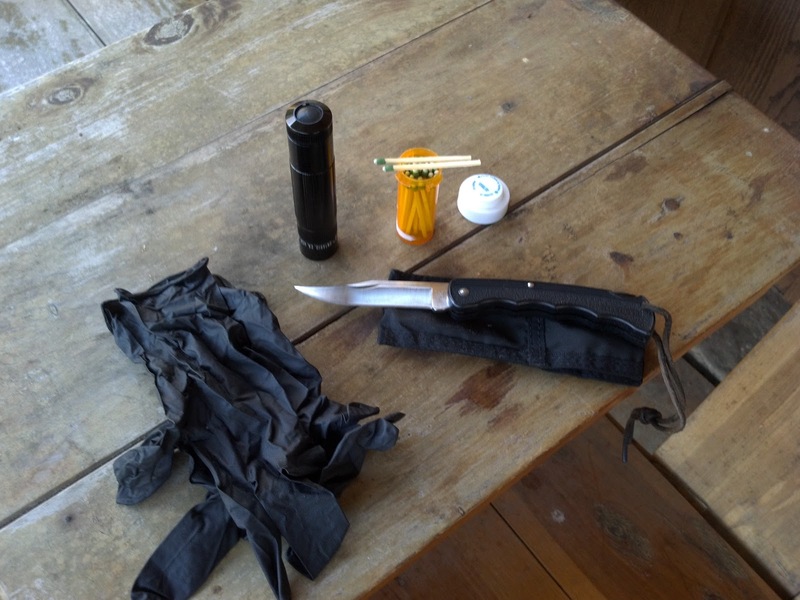 I carry a lighter all the time and strike anywhere matches that I keep in a pill bottle in my pack. Non-latex Gloves: I keep a box of non-latex gloves in my truck to stock or hand out during a Search and Rescue or Medical Reserve Corps incident and to have on hand at work. During my Texas hunt I used gloves for the first time to skin and process a deer. As soon as I got back, I put a pair in my pack to have to field dress my next deer. Using gloves makes everything less messy and cleaning up is a cinch. 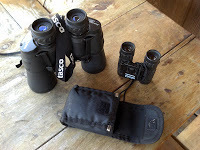 My Binoculars: I have two different binoculars that I use – one big and one small. 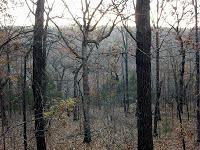 I like to scope the farthest edge of my visible area and try to catch a look at the deer coming in before they get too close. I have had too many deer suddenly appear in range with no warning so I have made looking harder, farther out a priority in my hunting. Plus I can’t hear worth a flip so seeing them first is the best option I have to getting the drop on a big buck. My Grunt Call: After hunting in Texas for the first time this year, I am starting to become a believer in grunt calls. 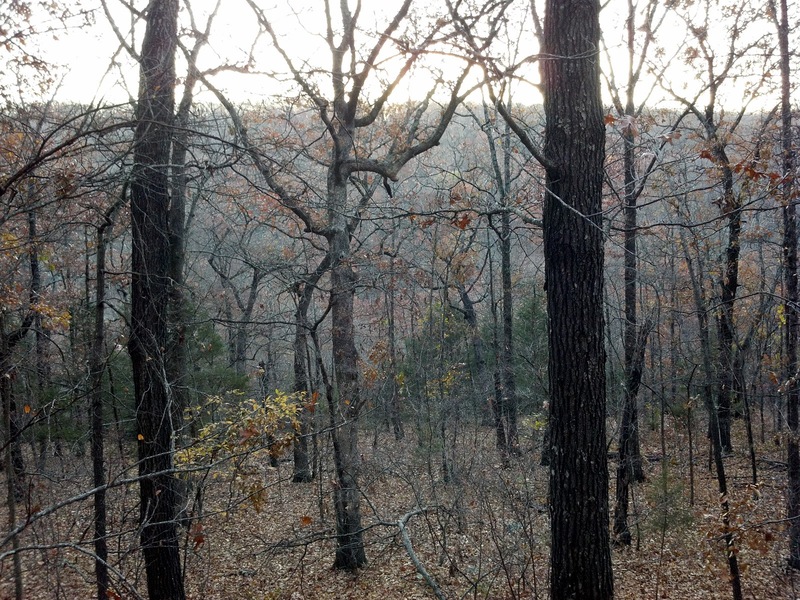 I have not had much luck with them here in Arkansas but after getting a small buck to come to me and having a big buck follow the smaller guy right up to me, I am have done more grunt calls in the Arkansas woods. I lost my old grunt call somewhere between home and Texas and didn’t realize it was not in my bag until opening morning of modern gun season and missed the chance to try to grunt in another nice buck. I now have a new one, but haven’t been able to call in a big buck yet. My Mask and Gloves: I use a mesh mask and mesh gloves that are marketed for turkey hunters to keep my face and hands from being seen. When I was squirrel hunting as a kid, I noticed that I could see my hunting buddy’s hands and face when he moved through the woods even though I couldn’t see any other parts of him. Deer see movement better than anything else, the flash of a hand moving or a face turning will give away a hunter more often than not unless they are covered. I like the masks best, but you can also paint your face like a Navy SEAL. Whichever you prefer. My Toilet paper: My Dad told me about when he was a kid and my grandfather took off into the brush to do his business and used a handful of weeds to clean up. Those weeds turned out to be what we call blister weed (I am not sure of the actual name of the plant.). That blister weed lit him up for several days after that. Ever since I heard that story I never go into the woods without TP. I prefer Charmin Ultra Tough in case you were wondering. 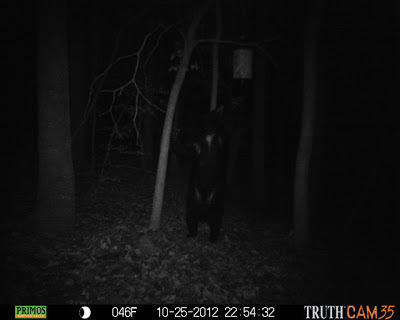 What gear do you carry while hunting in the woods? Tux reaching for the feeder. For the record, I also carry the TP in case I have a chance run in with Tux. Check out www.BerettaUSA.com and make sure you follow Beretta on Facebook, Twitter and YouTube. If you have any questions or want to contact me, you can follow me on Twitter @thejasonparks. I don't tweet a lot but I do enjoy keeping up with other shooters and hunters on Twitter and on Instagram.